A thick roll of sushi made with stewed kanpyo gourd, atsuyaki tamago (thickly rolled omelette), sakura denbu, and other ingredients. Inexpensive and easy to prepare. Simply microwave, let sit, and enjoy. Each package is 280g (1 sushi roll) and arrives frozen. 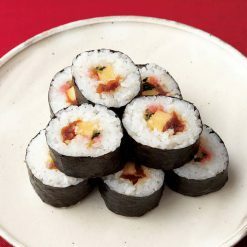 Futomaki sushi rolls are very thick and often contain several colorful ingredients. These inexpensive and easy to prepare futomaki can be enjoyed in the comfort of your home, using only your microwave! This futomaki contains quite a few ingredients, including kanpyo gourd sakura denbu. The kanpyo, or dried gourd shavings, were stewed and reconstituted before being added to the sushi, and are sweet and delicious. Sakura denbu is flaked fish, seasoned to be both sweet and salty. It is called sakura, or cherry blossom, because it is dyed a pretty pink color. 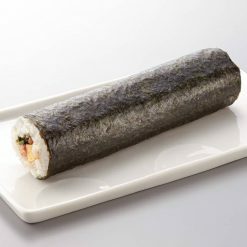 Futomaki can be cut into slices to eat, or can be held and eaten whole, rather like a burrito. Futomaki is popular year round, and special types of futomaki are also eaten as part of the winter Setsubun Festival. The Setsubun futomaki must be eaten whole (depending on whom you ask, there are different explanations for why the Setsubun futomaki must be whole; one of which is that it will bring good luck). You must also face in a particular lucky direction while eating Setsubun futomaki. To microwave: Open the sushi package, and place the sushi (still frozen) in a microwave-safe container. Cover the container lightly with plastic wrap, and microwave approximately as follows. In a 500W microwave, heat for 3 minutes 30 seconds. In a 600W microwave, heat for 3 minutes. After microwaving, let the sushi sit as-is for 20 to 30 minutes. Then, cut the roll into slices and enjoy. If it should happen that after microwaving for the suggested lengths of time the rice is still hard or has not defrosted, microwave for an additional 30 seconds to 1 minute. This product contains sushi rice (rice, rice vinegar, sugar, table salt), stewed kanpyo gourd (kanpyo gourd, soy sauce, sugar), atsuyaki tamago (thickly rolled omelette) (chicken eggs, sugar, brewed vinegar, wheat starch, soy sauce, rice wine for cooking, table salt), seasoned spinach (spinach, soy sauce, wine for cooking), toasted nori seaweed, sakura denbu (gadid, sugar, reduced sugar syrup, soy sauce, table salt, red yeast rice colorants).. Origin of ingredients: rice, chicken eggs (domestic), kanpyo (China). Prepared and packaged in Japan.